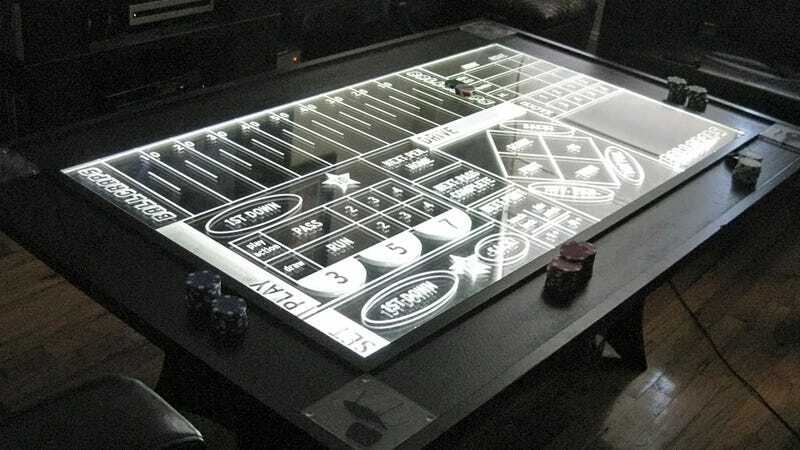 This stunning CNC routed plexiglass table with LED edge lighting is not only designed to be a lovely addition to your living room, it also lets you play a new betting game that has you and your friends placing wagers on every aspect of a football game while it's being played. Ballcraps is described as a cross between sports betting and craps, but instead of winners and losers being decided by a pair of dice, all bets are dependent on how the game plays out. So for instance, moments before the next play unfolds, you and a friend can place bets on what's going to happen, using the various areas of the table to place your chips and mark your predictions. And whoever's right, claims their chips and bragging rights. The concept might seem a little complicated, but it's explained in more detail in this video. Basically, it's the perfect way for a room full of armchair quarterbacks to prove who actually knows the game the best.